By Crawford Manufacturing Co. Inc. 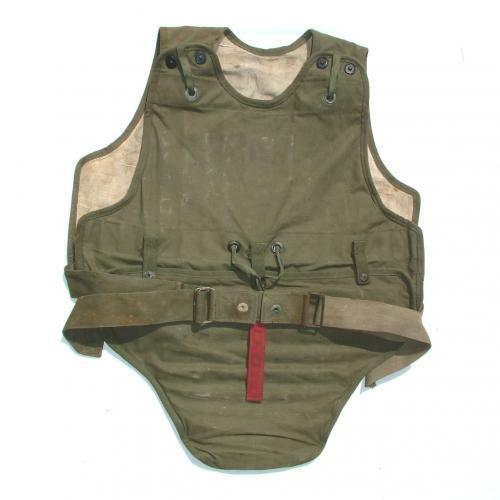 The M-2 vest was similar to the British made Type B and was designed for use by pilots and other aircrew who were positioned in armoured seats. It is comprised of the fully armoured M-1 and M-2 front piece and non-armoured M-2 back piece. This example is fitted with the M-3 flyer's apron which is virtually identical to the British Type C. The separate pieces of the vest were linked via cords and lift-the-dot fasteners and were constructed such that a quick tug on one strap would enable the entire suit to fall away from the airman in case of emergency. The material is a bit rubbed and soiled with few small cuts and one stitched repair, but remains in very good overall condition. The back piece is more stained/dirty and the lining material is quite grubby (front and apron more so than the back). Each piece is labelled with the manufacturer's details etc and marked with the weight of the piece. Some of the metal components have verdigris deposits, part of the belt has been replaced and has corroded buckle parts. Flak suits were issued from a 'pool' prior to missions and returned at the end of the 'Op' for use by outgoing crews. They were developed as a direct result of injuries sustained by 8th AAF crews flying from England. Initially there was considerable resistance and objection to wearing them but it is estimated that they reduced flak and bullet fatalities by 50% & injuries by 70%. Extremely heavy and may, in some circumstances require postal costs over and above those quoted by the 'online calculator'. A superb display piece. Stock code M21315.